The Campbell 39 is built on an Atlantic 37 hull and extended 2′ before being delivered to Oxford. This boat can be a Sedan, Flybridge Cruiser, or Express and is powered by a Cummins QSC 600 hp motor. The boat is fully appointed with cherry/satin finish, a teak and maple plyood or solid teak sole, and a sliding door by the helm. 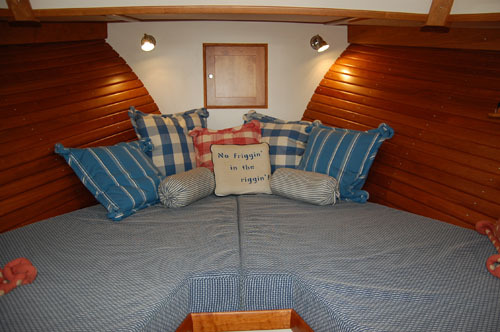 It has two staterooms, a galley, and a spacious dinette and entertainment center. 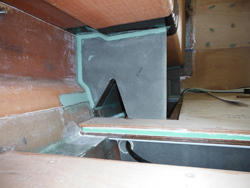 The 37′ hull was designed by Spencer-Lincoln in 2000, with a designed displacement of 18000 lbs. and a hull design that combined traditional downeast lines and keelson with the modern planing type hull for performance. She rides very level on her lines, which allows great visibility and also enhances stability while on the hook. Last but not least, performance is 18-knot cruise with a top speed of 24 knots when she is full of fuel and provisioned to cruise (add 2 knots for Sedan or Express).